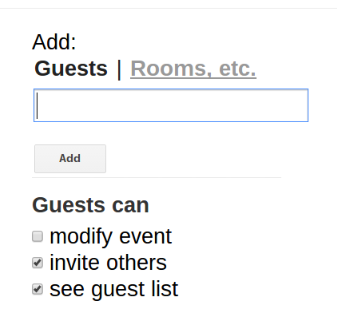 In the last post I showed you how to add an event, now I would like to demonstrate how to share an event. Why would you want to do this? Well let's say you are having a planning meeting with several co-workers, you could create an event and share it with the co-workers you'd like to invite. The first way you could share the event is by specific co-workers. If you were having a meeting with a few co-workers this is the approach you'd most likely take. All you need to do is input a co-worker's email address, and select the permissions you want to give them. These permissions are for the event itself. So the question you should ask yourself is, after you share the event, do you want co-workers to be able to modify event, invite others, or see the guest list. I can think of scenarios where it would make sense to select or de-select any of these permssions. 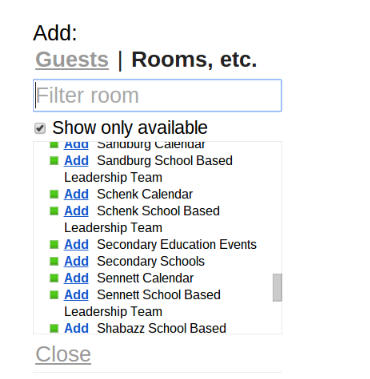 Another way to share an event is by rooms. These would be for larger meetings, schools and committees. In our example, Schenk has two options Schenk Calendar and Schenk Leadership Team. If you had the correct permissions you could share your event to these calendars. Correct permissions mean you can normally add events to these calendars. Most of the time the first method should suffice. In the video that follows I take you through the steps of sharing an event using the first approach.